This was my 20th cruise on HAL, third to Antarctica, and one on which I attained 4-star Mariner status, so I was looking forward to a wonderful celebration of all the quality and excellence which introduced me to HAL 20 years ago. Instead, I found a cruise whose guests included too high a proportion of those for whom etiquette was never a strong point, an indifferent cruise director and front staff, a captain conspicuous by his absence, and a ship whose dining room and Crow&apos;s Nest were an ice box (16 degrees Celsius). That the weather was foul for all but eight days did not help, and I feel truly sorry for the dining room and cabin stewards who now have to service four times as many guests, per staff member, as they did 20 years ago. How they manage to remain polite and cheerful under such strenuous conditions is beyond me. They deserve every dollar in gratuities that they receive, yet still many, especially those from countries in which tipping is not expected, remove tips from their onboard accounts. In addition, there were many customers who selfishly cut in lines in the Lido, when obtaining tender tickets, and boarding. At times it felt like we were with football hooligans, which management did nothing to control. I have been taking this specific cruise now every five years, just to research for myself the ice depths in Antarctica as the itinerary is always the same, and it is interesting to compare what I observe with my own eyes to what other groups claim with regard to whether or not there is evidence of global warming. 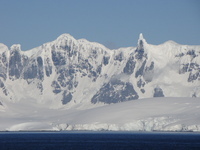 On this occasion, within Antarctica, the weather was worse than ideal, however, the Captain chose not to go even visit the Lemaire Channel (he announced he had spoken to other ships who said it was icy), and blamed ice for his decision not to sail behind Couverville Island, even though a Silversea boat traversed the channel, and which a different Captain on Zaandam had done five years ago. As with most experienced cruisers, I rarely buy the HAL excursions because they are often two to three times the price of locally arranged tours, they see less, they have a mandatory shopping opportunity, and they cater to the slowest traveler. I have repeatedly suggested in my after-cruise questionnaire that HAL provide at least one full day, strenuous excursion for active customers, but to no avail. I arranged exceptional local tours in Castro, Puerto Chacabuco and Montevideo, and because I had been to BA and Santiago twice before, arranged my own walking tours there. At 3 mph, you can see almost everything of historical interest in both cities in a day. With this itinerary, you have to be aware that the weather is usually bad, and so scenic cruising, which is the most unbelievable when the sun shines, can turn a tour called Symphony of Lakes and Volcanoes into a symphony of wind and rain, with absolutely nothing to see. But with that in mind, the ship should be a welcoming refuge where you can heat up and dry off. As the self-service laundries have been removed, there is now no way to dry wet clothes. And because I had experienced an ice box on the Prinzendam to Norway in June, I brought a thermometer with me on this trip, and on occasion, the main dining room and Crows Nest were at an Arctic 16 degrees Celsius (61F). Initially the Maitre d denied it, refusing to look at my thermometer, then when I requested an appointment with the chief engineer, was told that there was a problem with the heating. By half way through the cruise, the number of people with hacking coughs was significant. Tendering was disappointing. At Falklands, because I not on a HAL tour, I was unable to get off the ship until two hours after the first tender departed (tender tickets were required and 800 guests were on HAL tours). And with all aboard always being half an hour before Stated departure time, an eight hour docking can turn into only five hours being available on shore. I am convinced that HALs goal is to get to international waters ASAP so they can open the casino. Given that the ship can sail at 23kts, but most of the time, cruised at 13 - 15kts, it was totally unnecessary to leave any of the ports as early as we did, and on a 22 day cruise with only eight opportunities to disembark, this is a serious error of planning. Etiquette was lacking everywhere. People cutting in line for tender tickets, cutting in line in the Lido, and surprisingly, given that the ship departs at the same time for everyone, pushing and shoving to get up the gangway ahead of the next person. A number of us took matters into our own hands on occasion telling people to get back, but no one from HAL would do so. The worst was in the Main Stage, where it seems that certain groups believe it is OK to talk loudly while performers are on stage, destroying the ambience for polite guests. Despite being requested to do so as part of his nightly welcome to guests, Bruce (cruise director) refused to ask attendees to refrain from talking during the show. As a real disappointment, my son had his jacket stolen from the lounge. HAL markets this trip as an expedition and employs an expedition team, which on my previous two trips have been genuine experts in their fields willing to impart knowledge to guests no matter what their political leanings or level of understanding. They would also provide running commentary during the scenic cruising about WHAT we were seeing and HOW it got there. However, on this one, with the exception of Bryan, who was fantastic, all they could do was point out snow, icebergs, and many whales, AFTER guests on the bow had seen them first! The leader, Scott, spent much of his lecture time making anti-Trump jibes, and refusing to engage in an actual discussion about causes and solutions. The two best staff members on this cruise (besides the delightful cabin stewards and waiters), were the Assistant Cruise Director, Sandra, and the EXC Guide Kevin, an Argentinian who was knowledgeable and pleasant, and who provided a very in-depth and factual, unbiased view of the UK/Argentinian dispute over the Falklands. As usual, up-selling by staff continues to intrude. It really is annoying when one is wearing headphones in the Crow&apos;s Nest to be tapped on the shoulder by a staff member asking if I want to make a reservation in the Canalletto. And taking away the two self-service laundries is a real slap in the face when you are on a three week cruise with a need to pack for both warm and cold clothes. While HAL may think that converting a laundry to a cabin garners $2,000 more per week in room fees, you can never calculate with certainty how many guests stop cruising with HAL because this amenity is no longer provided. And given that the ship had 100 empty cabins, what good did it do to take away the laundry? After 20 years of cruising with HAL, unless they return to the elegant days - by setting expectations such as a REQUIRED dress code in the main dining room, and enforcing silence in the Main Stage - I will probably be trying something different. A real shame, because I achieved 4-star status on this cruise, and have had many happy memories. This was my 20th cruise on HAL, third to Antarctica, and one on which I attained 4-star Mariner status, so I was looking forward to a wonderful celebration of all the quality and excellence which introduced me to HAL 20 years ago. Instead, I found a cruise whose guests included too high a proportion of those for whom etiquette was never a strong point, an indifferent cruise director and front staff, a captain conspicuous by his absence, and a ship whose dining room and Crow&apos;s Nest were an ice box (16 degrees Celsius). That the weather was foul for all but eight days did not help, and I feel truly sorry for the dining room and cabin stewards who now have to service four times as many guests, per staff member, as they did 20 years ago. How they manage to remain polite and cheerful under such strenuous conditions is beyond me. They deserve every dollar in gratuities that they receive, yet still many, especially those from countries in which tipping is not expected, remove tips from their onboard accounts. In addition, there were many customers who selfishly cut in lines in the Lido, when obtaining tender tickets, and boarding. At times it felt like we were with football hooligans, which management did nothing to control. 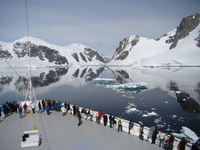 I have been taking this specific cruise now every five years, just to research for myself the ice depths in Antarctica as the itinerary is always the same, and it is interesting to compare what I observe with my own eyes to what other groups claim with regard to whether or not there is evidence of global warming. On this occasion, within Antarctica, the weather was worse than ideal, however, the Captain chose not to go even visit the Lemaire Channel (he announced he had spoken to other ships who said it was icy), and blamed ice for his decision not to sail behind Couverville Island, even though a Silversea boat traversed the channel, and which a different Captain on Zaandam had done five years ago. As with most experienced cruisers, I rarely buy the HAL excursions because they are often two to three times the price of locally arranged tours, they see less, they have a mandatory shopping opportunity, and they cater to the slowest traveler. I have repeatedly suggested in my after-cruise questionnaire that HAL provide at least one full day, strenuous excursion for active customers, but to no avail. I arranged exceptional local tours in Castro, Puerto Chacabuco and Montevideo, and because I had been to BA and Santiago twice before, arranged my own walking tours there. At 3 mph, you can see almost everything of historical interest in both cities in a day. With this itinerary, you have to be aware that the weather is usually bad, and so scenic cruising, which is the most unbelievable when the sun shines, can turn a tour called Symphony of Lakes and Volcanoes into a symphony of wind and rain, with absolutely nothing to see. But with that in mind, the ship should be a welcoming refuge where you can heat up and dry off. As the self-service laundries have been removed, there is now no way to dry wet clothes. And because I had experienced an ice box on the Prinzendam to Norway in June, I brought a thermometer with me on this trip, and on occasion, the main dining room and Crows Nest were at an Arctic 16 degrees Celsius (61F). Initially the Maitre d denied it, refusing to look at my thermometer, then when I requested an appointment with the chief engineer, was told that there was a problem with the heating. By half way through the cruise, the number of people with hacking coughs was significant. Tendering was disappointing. 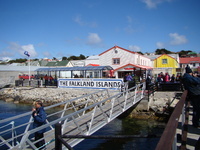 At Falklands, because I not on a HAL tour, I was unable to get off the ship until two hours after the first tender departed (tender tickets were required and 800 guests were on HAL tours). And with all aboard always being half an hour before Stated departure time, an eight hour docking can turn into only five hours being available on shore. I am convinced that HALs goal is to get to international waters ASAP so they can open the casino. Given that the ship can sail at 23kts, but most of the time, cruised at 13 - 15kts, it was totally unnecessary to leave any of the ports as early as we did, and on a 22 day cruise with only eight opportunities to disembark, this is a serious error of planning. Etiquette was lacking everywhere. People cutting in line for tender tickets, cutting in line in the Lido, and surprisingly, given that the ship departs at the same time for everyone, pushing and shoving to get up the gangway ahead of the next person. A number of us took matters into our own hands on occasion telling people to get back, but no one from HAL would do so. The worst was in the Main Stage, where it seems that certain groups believe it is OK to talk loudly while performers are on stage, destroying the ambience for polite guests. Despite being requested to do so as part of his nightly welcome to guests, Bruce (cruise director) refused to ask attendees to refrain from talking during the show. As a real disappointment, my son had his jacket stolen from the lounge. HAL markets this trip as an expedition and employs an expedition team, which on my previous two trips have been genuine experts in their fields willing to impart knowledge to guests no matter what their political leanings or level of understanding. They would also provide running commentary during the scenic cruising about WHAT we were seeing and HOW it got there. However, on this one, with the exception of Bryan, who was fantastic, all they could do was point out snow, icebergs, and many whales, AFTER guests on the bow had seen them first! The leader, Scott, spent much of his lecture time making anti-Trump jibes, and refusing to engage in an actual discussion about causes and solutions. The two best staff members on this cruise (besides the delightful cabin stewards and waiters), were the Assistant Cruise Director, Sandra, and the EXC Guide Kevin, an Argentinian who was knowledgeable and pleasant, and who provided a very in-depth and factual, unbiased view of the UK/Argentinian dispute over the Falklands. As usual, up-selling by staff continues to intrude. It really is annoying when one is wearing headphones in the Crow&apos;s Nest to be tapped on the shoulder by a staff member asking if I want to make a reservation in the Canalletto. And taking away the two self-service laundries is a real slap in the face when you are on a three week cruise with a need to pack for both warm and cold clothes. While HAL may think that converting a laundry to a cabin garners $2,000 more per week in room fees, you can never calculate with certainty how many guests stop cruising with HAL because this amenity is no longer provided. And given that the ship had 100 empty cabins, what good did it do to take away the laundry? After 20 years of cruising with HAL, unless they return to the elegant days - by setting expectations such as a REQUIRED dress code in the main dining room, and enforcing silence in the Main Stage - I will probably be trying something different. A real shame, because I achieved 4-star status on this cruise, and have had many happy memories. A typical South American city. We did enjoy our wanderings, and came across the National Toilet Museum (between Opera Colon and Recolettta). Fascinating. The Uraguayan tour guide was so proud of his country it made the tour personal. Lovely scenery on a nice day. If weather is bad, don&apos;t get off ship! When there were penguins at Seno Ottway, this was a wonderful stop. However, mining activities are believed by some to have led to the penguins&apos; departure three years ago. So now you just have a pleasant little market place to buy wonderful woolley clothes, and take advantage of the free Chilean Wi-fi. I love the Falklands. The people are so polite. Captain elected not to dock. A shame as the sun was shining and I wanted to take a picture by the end of the world sign in my shorts and flip flops, as on my previous two trips, I was wearing waterproofs from head to toe.